I had a good weekend and I'm gonna tell you about it. First off, BLIP Magazine's super awesome guest editor Courtney Eldridge blasted me with an acceptance for BLIP's January issue. RAD. What's even radder is that the piece is an excerpt from my forthcoming novel(la) Freight. SUPER RAD. Next up is Vol. 1 Brooklyn's Sunday Stories series. It kicked off today with Insanity & the Russian Doll Conundrum, an excerpt from Justin Maurer's forthcoming book Doctor, I Don’t Wanna Be Crazy Anymore. RAD. What's also rad is that yet another excerpt from Freight is going to appear in Vol. 1 Brooklyn's Sunday Stories before too long. RAD RAD RAD. There's already an excerpt from Freight floating around the universe in the pages of Dark Sky Magazine's debut print issue. WICKED RAD. 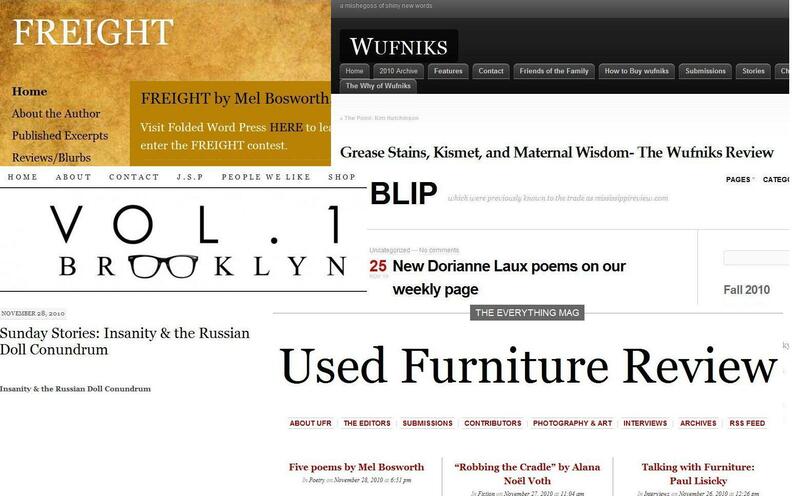 And today a wonderful review of my novella Grease Stains, Kismet, and Maternal Wisdom appeared over at the very cool Wufniks. RADNESS. Lastly, you can read 5 poems I done did write over at the bustlingly awesome USED FURNITURE REVIEW. I also ate a huge plate of spaghetti and meatballs and then made a RAD dutch oven. Whoo whoo! I'm very happy for you, Mel. I just purchased Courtney Eldridge's story collection, Unkempt. I look forward to the read. Thanks, Ethel. Happy back at you. Electronic high fives. Thanks, Bones. Just trying to keep up with you. You don't make it easy.